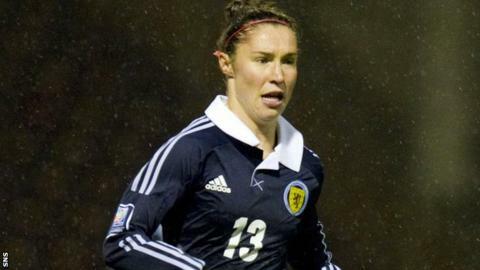 Striker Jane Ross scored a hat-trick as Scotland came from behind to beat Bosnia 3-1 in their World Cup qualifier. Monika Kulis gave Bosnia the lead in Zenica but Ross's second-half treble sealed a sixth consecutive victory for Anna Signuel's side. The win moves Scotland six points clear of Group 4 favourites Sweden, who have two games in hand. Scotland host the Swedes at Fir Park in June, before facing Northern Ireland. The group winners qualify for the finals in Canada next year, while the runners-up could enter a four-team play-off for one place. Scotland crushed Bosnia 7-0 earlier in the campaign but Kulis's superb finish in the 18th minute, a long-range effort beyond Gemma Fay, illustrated their attacking threat. Leanne Crichton bundled the ball in to the net soon after following a melee in the penalty box, but was flagged offside. Ross had a penalty claim waved away after colliding with Bosnian goalkeeper Envera Hasanbegovic before she rifled home the equaliser after Lisa Evans's shot was blocked. The Vittsjo GIK striker put the Scots ahead in the 74th minute with a diving header and sealed her hat-trick with four minutes remaining following good work by Evans. Scotland entertain Sweden in their next qualifier on 14 June and travel to Northern Ireland five days later. Bosnia-Herzegovina: Hasanbegovic, Spahic (c), Nikolic, Fetahovic, Aida Hadžic, Kuliš, M Hasanbegovic, Dijakovic, Kuliš, Radeljic, Crnjak. Subs: Hodžic, Jašarevic, Alma Hadžic, Boškan, Kadric, Mujkic, Ahmic.